In spring 2011, director Stig Björkman met Ingrid Bergman's daughter Isabella Rossellini and she suggested that they "make a film about Mama." Through Isabella, Björkman was able to tell Ingrid's story through her own words and images. Seven time Academy Award nominee and three time Academy Award winner Ingrid Bergman was one of the most talented actresses of Hollywood's Golden Age with unforgettable performances in films such as Casablanca (1942), Gaslight (1944), and Autumn Sonata (1978). 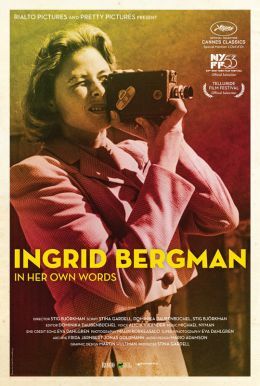 Through never-before-seen private footage, notes, letters, diaries, and interviews with her children, Ingrid Bergman - In Her Own Words presents a personal portrait and captivating look behind the scenes of the remarkable life of a young Swedish girl who became one of the most celebrated actresses of American and world cinema.